Powerful and efficient, the SEDA Gearbox drilling machine is the high efficiency solution to drain waste oils from engines, transmissions and rear differentials. The SEDA Gearbox drilling machine evacuates waste oils from engines, transmissions and rear differentials by drilling into the oil casings or pans. The height adjustment and drill speed are achieved by means of a gas spring and the foot pedal. Following the drilling process a specially designed rubber boot maintains the suction pressure to allow a virtually spill free drainage. The product is designed to drain waste oils without the need for the operator to attend the process after the initial setup. The Gearbox drill allows to easily and effectively drain engines, transmissions and rear differentials without or with compromised drainage plugs. An optional funnel serves an additional time saving convenience to drain waste oils. A short distance of the suction hose is made transparent to allow visual control of the drainage process. A set of distance sleeves prevent the drill to penetrate too deep into waste oil containing containers resulting in possible damage from touching hardened gears. Proper use of distance sleeves is imperative for drill and drill bit longevity. 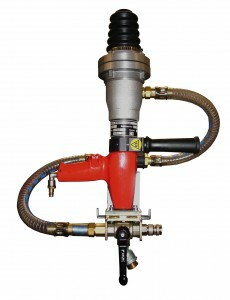 The SEDA-Gearbox drill is a flexible system and can ideally be used in a variety of settings. The robust gearbox drill is manufactured either with a mobile base on wheels or comes mounted to a swing arm with integrated suction hoses. Spare parts are easily available and are assembled with ease with tools included with the Gearbox drill. Also included are a spare rubber boot, 500 closing plugs and the suction hose and air hose necessary.